Charophyceae are relatives of land plants, whose genomes have been envisioned to contain important information to understand how land plants evolved from their ancestors in the Paleozoic era. Here we report the draft genome of Chara braunii from Charophyceae, and its comparison to land plants, Klebsormidium nitens, and other green algae. The comparison revealed acquisition of genes before and after the divergence of Charophyceae in the lineage leading to land plants, as well within Charophyceae. Three groups of green algae are evolutionarily closer to land plants than Klebsormidiophyceae, that is, Charophyceae, Coleochaetophyceae and Zygnematophyceae (Figures 1 and 2). Among them, the Charophyceae form the most complex bodyplan with reproductive organs, antheridia and oogonia. In fact, Pringsheim, in the 1860s, already suggested that Chara (presently placed in Charophyceae) is closely related to land plants. Zygnematophyceae are considered to be the extant lineage closest to land plants, but they have a sexual reproduction system, in which gametes (reproductive cells) that are almost equal in size fuse to form zygotes, rather than with a large egg and a small swimming sperm cell. In the present study, we reveal the genome of Chara braunii*1), which is considered to have separated from land plants 550 to 750 million years ago. Here, 60 researchers from 40 institutions of 13 countries participated in the genome analysis of Chara braunii, a representative of Charophyceae*2). They have obtained a draft genome sequence, which is practically sufficient for comparison with the genomes of other organisms. The draft genome sequence is deposited at the DNA Data Bank of Japan (DDBJ*3)) and available through the International Nucleotide Sequence Database Collaboration (INSDC). 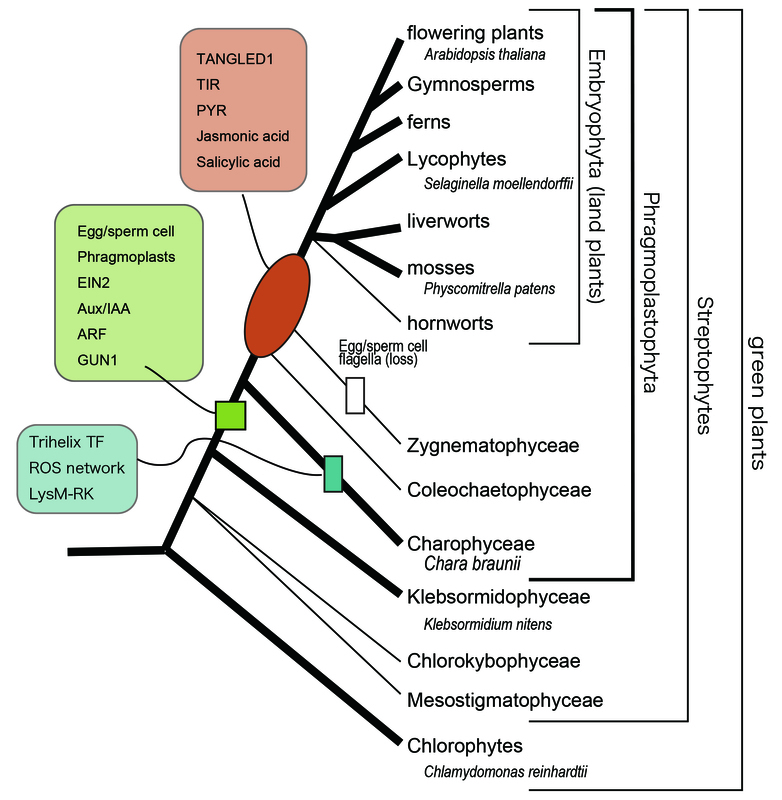 The last common ancestor of Charophyceae and land plants was estimated, in this study, to possess all the genes known from land plants for cell division except one, TANGLED1. Among the genes known to be involved in the phytohormone biosynthesis and responses of land plants, Chara braunii was found to possess all the genes involved in the ethylene signaling system, while Klebsormidium nitens lacks one gene, EIN2. In addition, Chara braunii is found to have genes encoding Aux/IAA and ARF, transcription factors (genes that regulate expression of other genes) involved in the auxin response. These genes were not found in Klebsormidium nitens. On the other hand, since the TIR1-type receptor is not found in either Chara braunii or in Klebsormidium nitens, there may be unknown mechanisms acting in auxin response. Receptors for abscisic acid (PYR), jasmonic acid, and salicylic acid were not identified, indicating that the receptors found in land plants were probably gained after separation of Charophyceae and land plants. 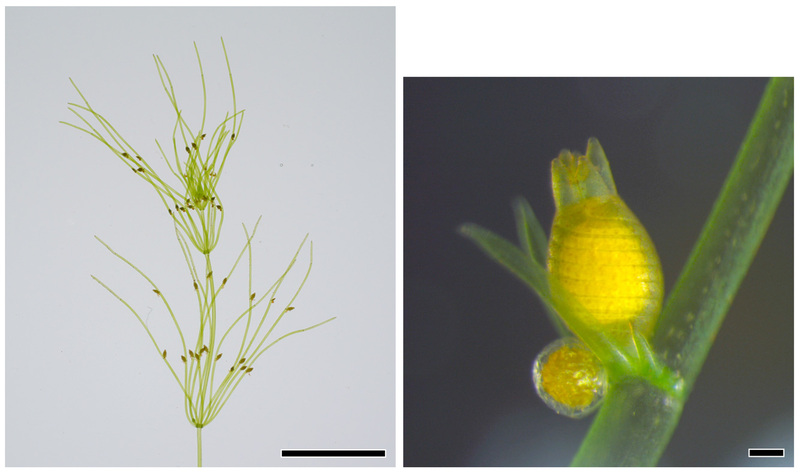 Furthermore, Chara braunii has an ortholog of GUN1, a key of the system to regulate the synthesis of chloroplast proteins by the “retrograde-” signaling from chloroplast to nucleus as seen in land plants. Chara braunii possesses more transcription factors than other green algae whose genomes have been determined. Figure 1. The Chara braunii strain 276 used in the genome analysis. Left: Thallus with a stem-like structure (axes) with whorls of branch-like structures (called branchlets), looking like a wheel. Scale bar, 100 μm. Right: Sexual reproductive organs formed on a branchlet. Upper, an oogonium; lower, an antheridium. Courtesy of Prof. Sakayama, Kobe University. Figure 2. A phylogenetic tree showing the evolutionary relationship of Charophyceae, land plants, and other green algae. Lineages with published genomes are shown with bold lines. Chara braunii, whose genome is described in the present study, represents the earliest diverging lineage to land plants in the Phragmoplastophyta. Chara braunii is one of the species of Charophyceae. Chara braunii is a large multicellular alga, living in fresh and in brackish water. Its thallus consists of stem-like structure (axes) and whorls of branch-like structures (called branchlets). The Japanese name, shajikumo, relates to its shape: a stem with branchlets looking like a wheel with spokes and a shaft (‘shajiku’) (‘mo’ means alga). A taxa including Chara, Nitella, and several other genera (Order Charales). While Charophyceae sometimes refer to broader organisms, here we refer to the same range as order Charales, as class Charophyceae, to match Klebsormidiophyceae, Coleochaetophyceae, and Zygnematophyceae. (Figure 2). Abbreviation of DNA Data Bank of Japan. A Japanese institution to gather nucleotide sequence database as a member of INSDC (International Nucleotide Sequence Database Collaboration). It operates at the National Institute of Genetics (Japan). In land plants, when a cell divides to give rise to two daughter cells, a new cell wall is formed between the two nuclei of the daughter cells. During this process, an array of microtubules, called the phragmoplast, perpendicular to this nascent cell wall is formed. 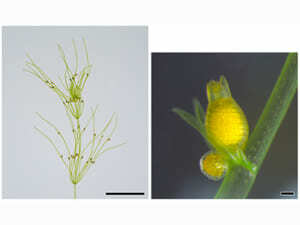 Phragmoplasts are formed in some green algae like Chara, evolutionarily close to land plants, but is not formed in Klebsormidium, a green alga more distantly related to land plants. In such green algae, cell division (cytokinesis) is completed by cleavage furrow. In some algal species, microtubules are formed parallel to the nascent cell wall, and called the phycoplast. Because of the unique presence of phragmoplasts, the Charophyceae, Coleochaetophyceae, Zygnematophyceae and Embryophyta (land plants) are also collectively referred to as Phragmoplastophyta. MEXT & JSPS grants-in-aid KAKENHI, and grants of the countries concerned.